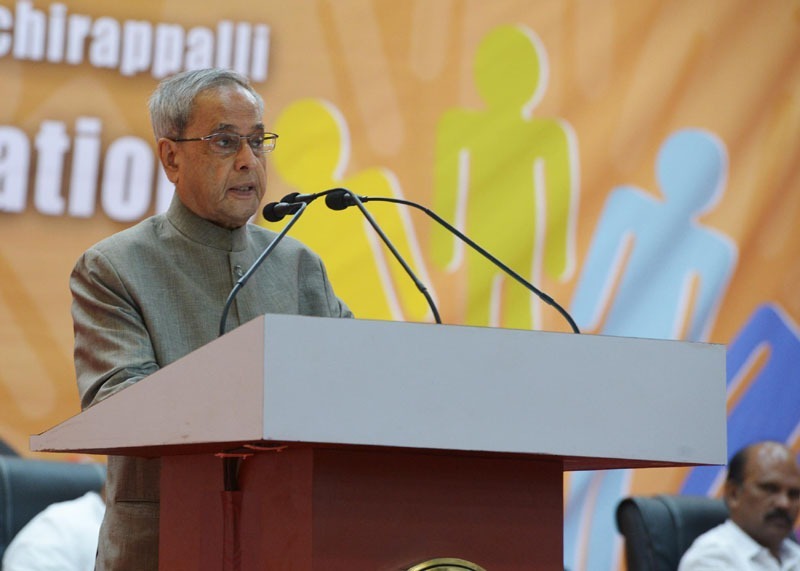 The President of India, Shri Pranab Mukherjee inaugurated the Golden Jubilee Celebrations of National Institute of Technology Tiruchirappalli on July 19, 2014. Speaking on the occasion, the President said knowledge and innovation are the underpinning of progress and prosperity in the twenty-first century. In this age of globalization, we can derive competitive advantage only from an eco-system that is conducive to new learning, research and innovation. NITs must work towards promoting scientific temper in their students. Yet, given the present socio-economic condition of our country, the thrust of research must be to erase backwardness and wipe out deprivation. Innovations must improve the state of the underserved, who want a positive difference in their lives. Institutions like NIT Trichy must support ingenuous ideas that promise betterment for those aspiring to rise up the socio-economic ladder – help a farmer till the soil better, an artisan perfect his craft or a small entrepreneur improve the productivity of his venture. The President said some of our IITs are in the top 50 in civil and electrical engineering. Five institutions are amongst the top 20 universities amongst BRICS nations. The number of Indian institutions in the top 100 in Asia has increased to 10 this year from 3 in 2013. The NITs, in particular NIT Trichy, should take a cue from successful Indian institutions on how to approach the rating system. Featuring in international rankings has several positive spin-offs, in terms of intangibles like boosting the spirits of students and faculty, to more tangible benefits like better placement for students. More importantly, active participation in rankings will propel the development of institutions in the right direction. The President said India has recently become a permanent member of the Washington Accord, which is an international accreditation agreement amongst 17 countries for professional engineering degrees. India’s entry will enable global recognition of our degrees and increase the mobility of our engineers. It will enjoin our technical schools to adhere to global benchmarks in quality.